Why a “Secrets of the Vine for Women” when there already was a secrets of the vine? Darlene Marie writes “Whenever I teach on this subject, women consistently express a desire to go deeper. 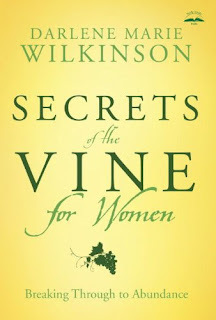 They want to learn more about how Jesus’ vineyard conversation applies to their experiences as women in today’s world. In short, they want to continue the conversation”. Isn’t that so true of women ! John 15 tells us the Jesus is the vine, God the vinedresser, and we as Christ followers are the branches. We are to bear fruit or do ‘good work’ as God has designed us to do. There are degrees of fruit bearing, or levels of good work. We need to be pruned by God just as the grape vines are pruned to bear more fruit. Darlene Marie shares examples of life stories from women who were being pruned and how that developed more fruit. God invites us to abide in Him, as that is the only way to produce the much fruit. We abide in Him by spending time with Him, reading the Bible, prayer, and keeping a spiritual journal. The book follows beautifully with the example of the grape vines and harvest season, weaving the visual of the grape growing and the abundance of fruit. Excerpts from “Secrets of the Vine Bible Study” as well as a study guide, lend themselves well to an individual study time or as a group setting on studying this passage in John. I would love to pass this review copy on to one of the readers as it is such a nice easy read, and so fruitful in capturing our relationship to God the Father and Jesus. Leave a comment below along with your email address and I will use Random.org to select a winner on May 30th, Memorial Day!! Sounds great, I'll be sure to look this one up. Thanks for the giveaway. So happy to have found your blog. I'm following now. And this book sounds lovely. Thanks for the review and giveaway.